When Safeway held their 8th annual Art of Dairy contest last year – an art contest for high school students – I was asked to create Lucerne dairy recipes to support the contest. I thought of recipes that would appeal to teenagers, like Quick Double-Cheesy Pizza or Creamy Tomato Penne Pasta Bake, and these peppery-hot cheesy popovers. Popovers take just 10 minutes to stir together. They are similar to a cream puff pastry but without the creamy filling. Pepper Jack cheese makes these popovers a savory variation to serve in place of dinner rolls, or for a spicy snack, or with a hot bowl of soup like Rita’s Sherried Mushroom Soup on a rainy day. Maybe if we cook for rainy weather we’ll get some moisture here in California! Combine flour, 1 cup of the shredded cheese, salt and cayenne in a medium bowl. Stir in milk and eggs until mixture is well blended. Divide butter between 12 muffin cups (scant teaspoon per muffin cup). Place pan in preheated oven for 3-5 minutes until hot and butter is melted. (This helps the popovers puff up). Remove pan from oven and tip to coat bottoms and sides of muffin cups with butter. Or use a brush to evenly butter muffin cups. Pour 1/4 cup batter into each muffin cup while pan is still hot. Sprinkle remaining 1/2 cup cheese evenly over batter-filled cups. Bake 25-30 minutes until popovers are puffed and well browned. Remove from oven and let stand 1 minute. Run a table knife around edges and lift popovers out of pan. Serve hot. – No need to use a special popover pan. A regular muffin pan works fine. – Popovers need to be baked thoroughly so the center is cooked and the outside is crispy. – If the pan is dark metal the popovers may bake a darker brown. – The popovers freeze super well in a zip-top bag. Reheat in oven or toaster oven until thawed and hot. Recipe by Rosemary Mark. Photo by Safeway. I adore popovers! I’m going to make these for super bowl Sunday to go with my chipotle black bean chili (recipe development in progress). Perfect match to your chili! 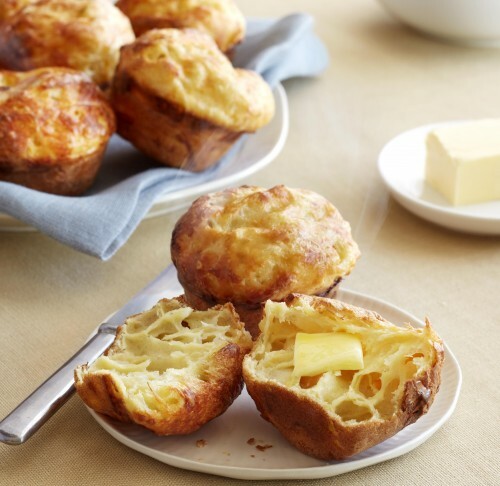 This Popover recipe looks real easy and a tasty photo too. With the Pepper Jack, they seem perfectly American. So, if not chili as an accompaniment, what about something also American like a Waldorf Salad, or a chopped salad. And spiced up with a glass of Gewurztraminer. Would that work? Or add something Italian like a Prosecco? This popover would be great with a salad, your Waldorf is interesting but I think I’d use sharp Cheddar with Waldorf. The cheese is interchangeable. And for beverage, how about a favorite cold beer to cool off the chili! Surprisingly, I’ve never made popovers. I don’t know why. My mom made them and I loved them so much. Pinning this to make them!! You’ll be surprised how easy they are — and don’t forget to watch them rising in the oven! There’s a caramel popover in the Feb. 2014 Bon Appetit, looks yummy! Oh fun! And I’ve got the new BA, I just haven’t taken the time to read it. But I will now. We head to Tahoe tomorrow and I’ll have a nice long car ride to look through it.